Shh!! It’s our secret menu, only for you, our loyal customers. These old favorites are still around even though you don’t see them on the menu. 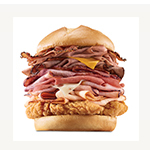 Just whisper your secret order to the cashier and the sandwich shall be yours.